Anyone found any organizers esp. well-suited to Nomad tools? Yes, I know I drew up: https://www.shapeoko.com/wiki/index.php/Carbide_Create_Photo_Tracing (and I need to find time to re-cut that and take a photo of one which doesn’t have egregious mistakes in the toolpaths), but I really need to just use the machine, not spend more time making accessories for it. which work well enough, but unfortunately, aren’t available in a version which has a front-back orientation for the molded in dividers, which I think would work better for the sort of things I’ve been storing for the Nomad. 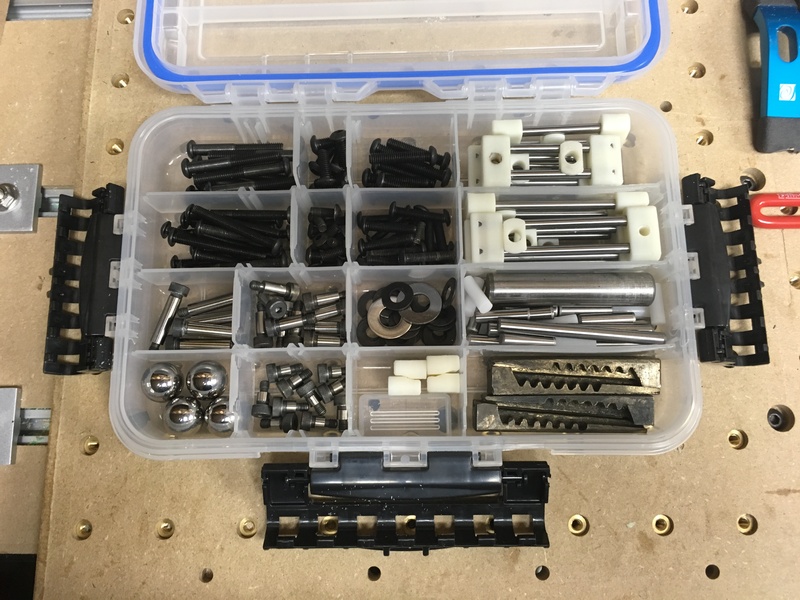 but it seems a bit large for the stuff I’d need to store for the Nomad (maybe if I use it for both the Nomad and Shapeoko?) — I believe that True Value carries a version which which a single stack, and I’m probably going to grab a couple of those on the way home (so that I can mix/match the organizers — they seem to have a couple of versions in it) — if it’s compatible w/ the HF version, then I’ll get at least one of those the next time I’m there — unless someone can suggest some brilliant option / organizer which is perfectly suited to the things which one needs for a Nomad. I use plastic boxes similar to your first flat box. 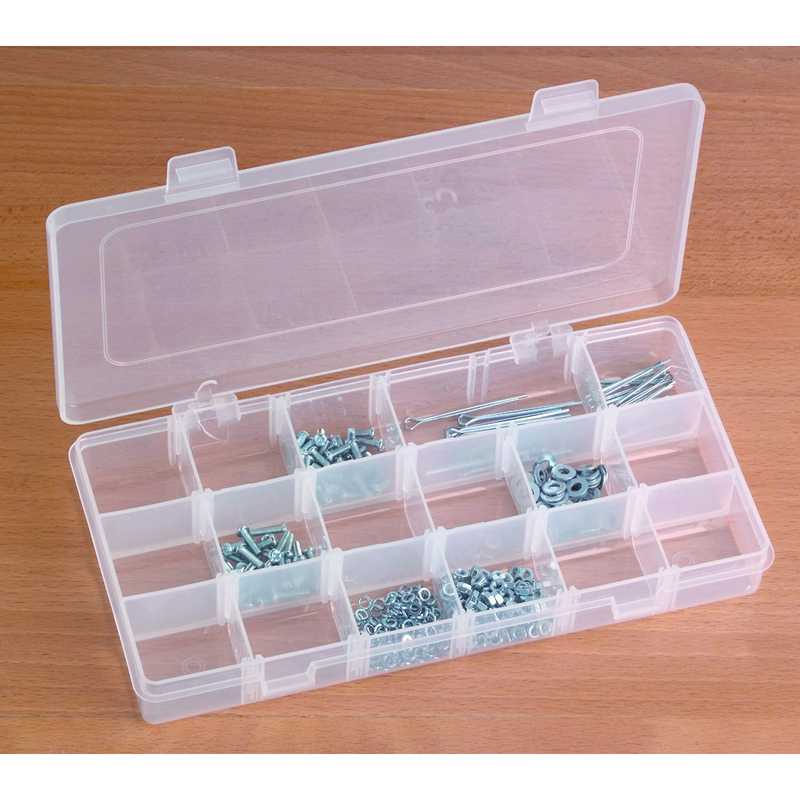 Yeah, that confirms that what I really want are plastic organizers w/ front–back molded in divisions, and (possibly) sub-dividers. Thanks! 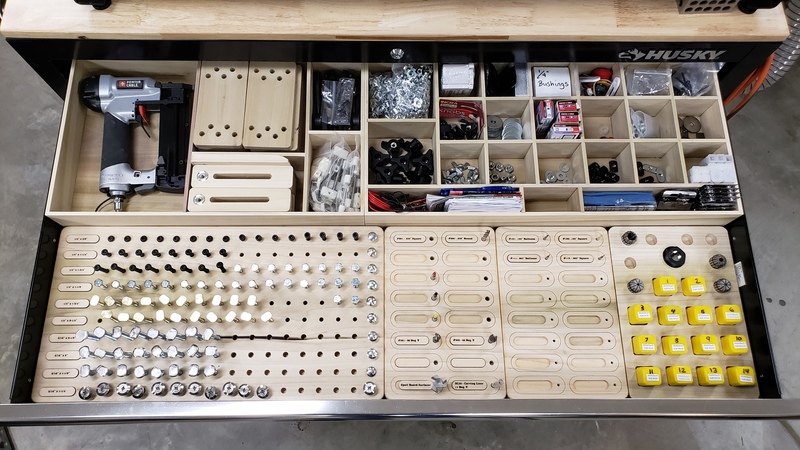 @RichCournoyer I’ve looked at / considered that draw set, but my problem w/ drawers is I don’t like labeling them, and if I don’t, I forget what’s in them if I don’t use it regularly enough. 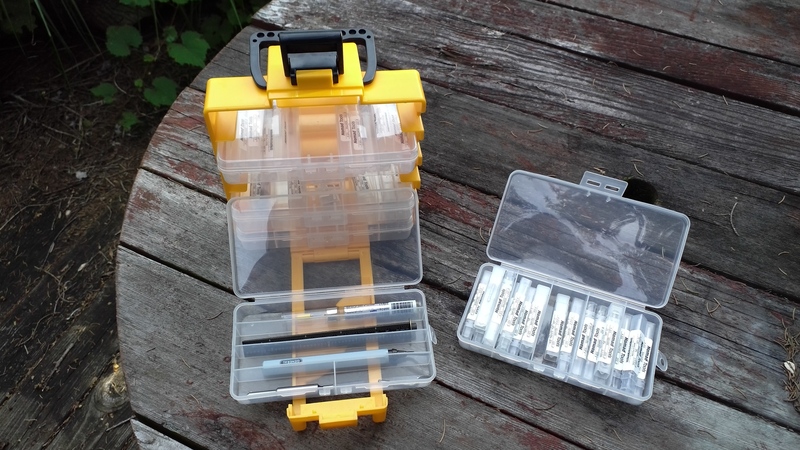 Right now I have my end mills and other accessories (wrench, sharpie, etc) in a DeWalt flat box with dividers. 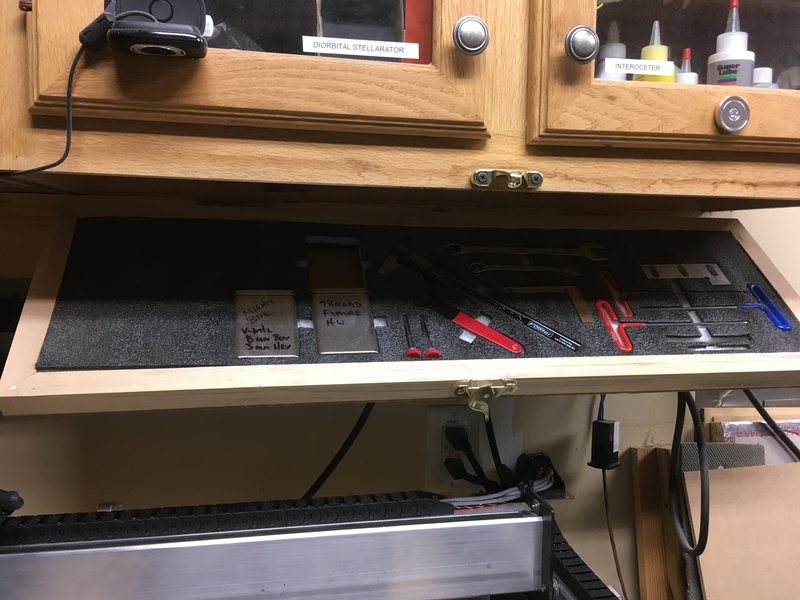 I’m planning to build a shallow drawer to mount under my work table and make dividers with labels. Will probably also keep masking tape, CA glue, double sided tape, etc. in the drawer. 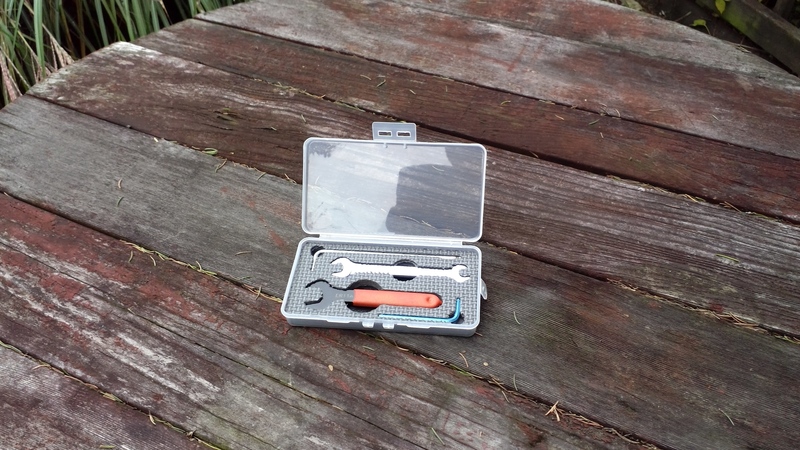 Less commonly used items will go in the DeWalt box. 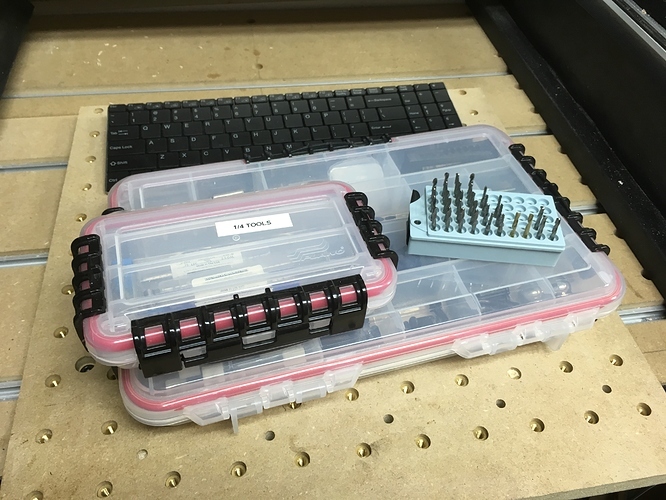 And keep endmills in the narrow drawer of a “top box” tool cabinet segregated into 1/4, 1/8, and “weird” in 6x9 plano boxes, and these nifty $5 endmill holders. 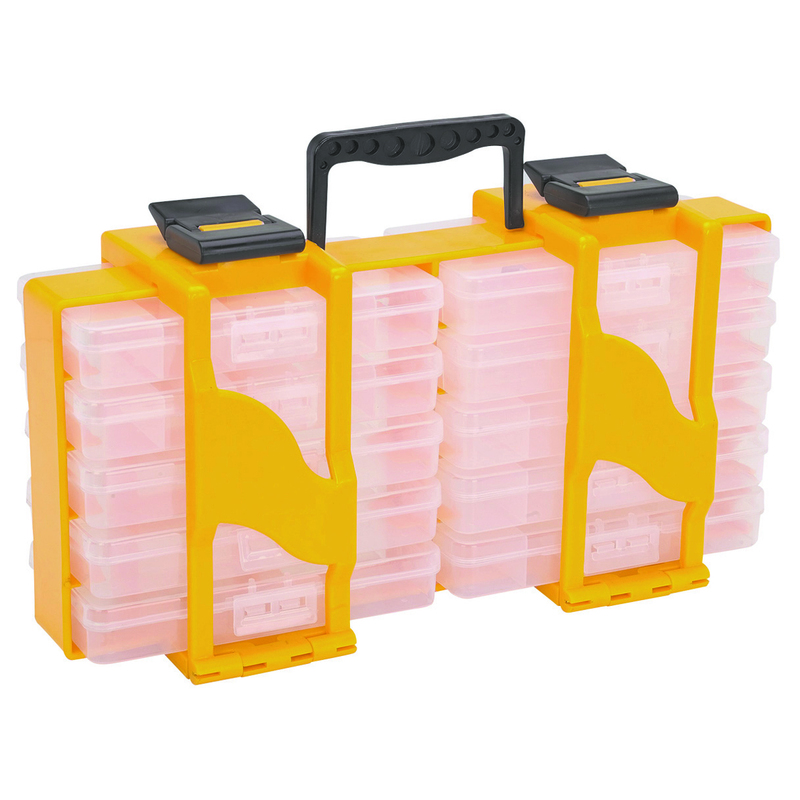 These are the best “storage box things” I’ve had - they’re durable, they’re really solid, they close very solid, and I use them for all sorts of stuff. I use dewalt boxes for screws/nails/bolts and stuff like that because I can pull the individual sorters out and bring them with me to a project, but I use these for pretty much everything else. I keep small tooling in the tube it comes in, and mark the cap with size and profile. 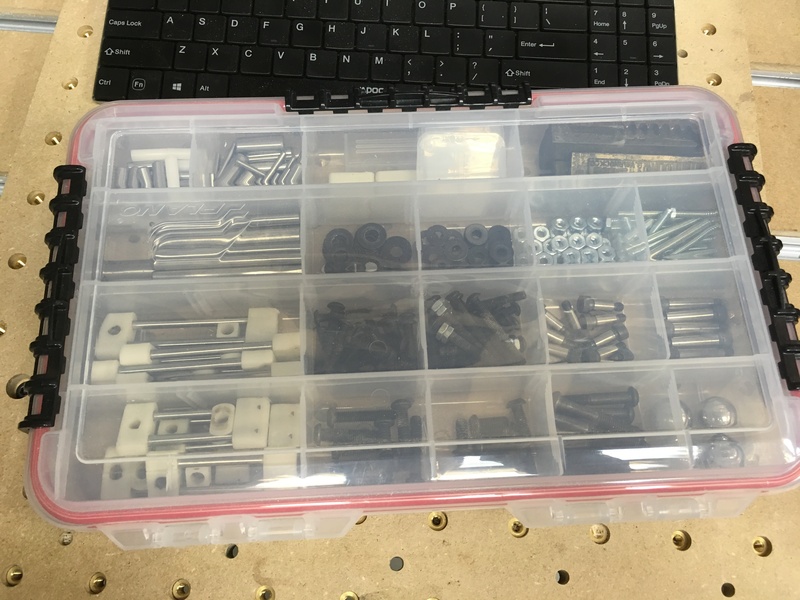 THese are organized in long, narrow (approx 450mm longX60mm wide) drawers that are the proper depth for the tubes to stand up. I am not sure what the drawer cabinet was made for, but it is perfect for the 75mm long tubes small tools come in. The whole cabinet is the the right size to use as a base for the Nomad, so I do, with vibration isolation between them, and underneath it. Any solution that doesn’t keep tht cutting edges protected, and me protected from them is a non-starter, so no rack like @mikep’s $5 holder. I would lose way too much blood, or chip the cutters up. I made up dividers so I can keep things organized within each drawer. 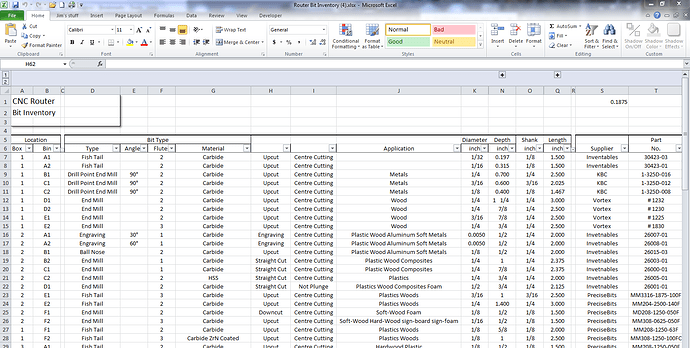 BTW @mikep, it is nice to know that I am not the only one here that uses quoins for workholding. I used them a lot more on the nomad, but they can sure be handy. Wish I had a key for them. and swapped around so that I had 4 of the front–back divided organizers in one, which fit all of my endmills and router bits (big improvement over the 3 separate plastic containers, the tin, and the other odd-shaped storage thing I was using) — using the long side-to-side compartment to hold a deburring tool, oil, and other odds and ends, but will move the collets at least to a different container to make all this work. There is a cover for the $5 holder, it’s Sir Not Appearing In This Picture, but does exist… I thought bits&bits had them, but don’t appear to any more. Wish I had a key for them. I was given a bunch of letterpress stuff and need to dig it out and put it to use (unfortunately, every time I’ve tried to arrange getting a printing press it’s always fallen through), and I’d like to think there’s at least one quoin key in it. No idea where all that is since we moved out and back into the house after a pipe burst. There are a fair number on eBay though, including one sold by an enterprising individual who is 3D printing the body and adding a steel insert. Well played. that is excellent.